The Android tablet market may have slowed down drastically over the last few years, but you can still pick up a fantastic slate in the Samsung Galaxy Tab S3 — we’d go as far as to call it the best Android tablet yet. This is one tablet that’s built to last — with 2-in-1 S Pen and keyboard capabilities, a beautiful HDR-ready screen and four thumping stereo speakers, the Tab S3 is high quality from whichever angle you look at it. 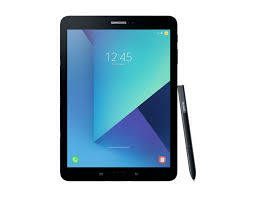 Thinner than its predecessor, the Tab S2, Samsung can still technically claim that the Tab S3 is lighter and slimmer than an iPad Pro, with dimensions of 237.3 x 169 x 6mm and a weight of 429g (comparatively, the iPad Pro is 6.1mm thick and weighs 437g). Admittedly, it isn’t hugely different to the Tab S2 in terms of design, with the Samsung Galaxy Tab S3 touting a small but likeable design upgrade that’s mostly noticeable from the back of the slate (which is now covered in glass, so don’t drop it! ), even if it’s easy to mistake it for Samsung’s previous generation tablet from the front. The real visual difference comes in the form of a HDR display, which delivers incredibly lifelike and exceptionally vibrant colours, as well as improved contrast. Meanwhile, its bangin’ four speaker setup offers a significant audio boost over the tablet’s predecessor, which could only boast a single mono speaker. And, thanks to its S-Pen compatibility, which makes it easy to use drawing and note-taking apps, the Tab S3 is a great tablet for productivity. If typing’s your thing, Samsung now offers a new and improved optional keyboard, which feels much sturdier than its flimsy predecessor, but now lacks a touchpad (not really that much of a deal-breaker when the tablet itself is one large touchscreen). Verdict: It's may not be the hardest call for us to make, given the all-round lack of competition in this dwindling space, but the Galaxy Tab S3 is the best Android tablet currently available. Premium Tempered Glass Screen Protector For Samsung Galaxy Tab S3 9.7"